The Auernhammer Sonatas Op. II. Composed by Wolfgang Amadeus Mozart (1756-1791). Edited by W. D. Seiffert and Wolf-Dieter Seiffert. Sheet music. Henle Music Folios. Urtext edition-paper bound. Classical Period. Collection and set of performance parts (softcover). With introductory text, performance notes, bowings and fingerings. 168 pages. G. Henle #HN78. Published by G. Henle (HL.51480078). Volume II contains the six sonatas which Mozart had selected for publication in 1781 as Opus II by Artaria in Vienna. They are dedicated to his pupil Josepha Barbara Aurnhammer, a talented pianist. 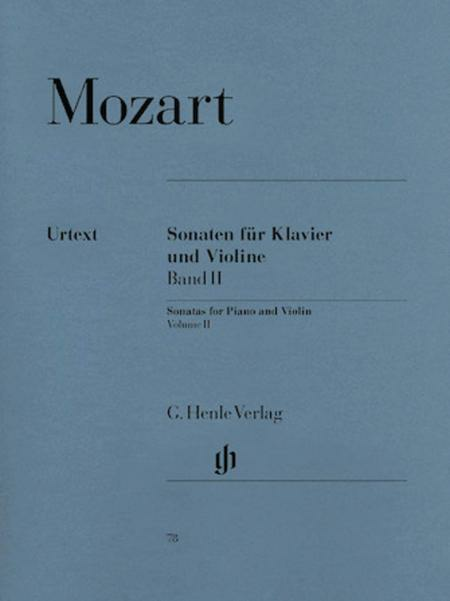 This edition of the Mozart violin/piano sonatas is excellent and printed beautifully. Mine arrived less than acceptable, but I'm glad that customer service responded quickly and sent me another copy undamaged.